→Sichenzia Ross Friedman Ference LLP Advises Laidlaw & Company on $6.72 million Secondary Public Offering of Novabay Pharmaceuticals, Inc.
Sichenzia Ross Friedman Ference LLP Advises Laidlaw & Company on $6.72 million Secondary Public Offering of Novabay Pharmaceuticals, Inc.
NEW YORK, March 25, 2014 (GLOBE NEWSWIRE) — New York- based securities law firm, Sichenzia Ross Friedman Ference LLP announced that it has represented Laidlaw & Company (UK) Ltd. as sole underwriter in a $6.72 million secondary public offering for Novabay Pharmaceuticals, Inc. (“NBY” NYSE MKT). The underwriting was pursuant to a prospectus supplement to an effective S-3 registration statement. The offering consisted of 5,600,000 shares of common stock and 18 month warrants to purchase 1,400,000 shares of common stock at combined offering price of $1.20 . 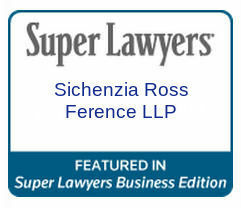 The Sichenzia Ross Friedman Ference LLP team was led by partners Richard Friedman and Stephen Cohen.